The dollar is not the only currency keeping investors up at night. There’s good reason to be concerned about confidence in the dollar in the years ahead. Trump’s decision to terminate the 2015 nuclear deal with Iran will force Iran into the hands of the Chinese for access to cash and access to the global payments system. Iran, Russia, China and Turkey have already formed what I call The Next Axis of Gold, where they can use shipments of non-traceable physical gold to settle balance of payment deficits between themselves, putting almost 1.5 billion people covering much of Asia on a de facto gold standard that is not tied to the dollar. Still, in the short run, there’s another currency to be concerned about, as this article reveals. The other currency facing challenges is the Chinese yuan. China is one of the most leveraged and indebted economies in the world. But, unlike heavily indebted Japan, China’s debts are widely dispersed among many borrowers, are denominated in dollars to a great extent, and are held in large measure by outside parties. World growth and world trade are both under threat from U.S. sanctions, tariffs and other forms of financial warfare. 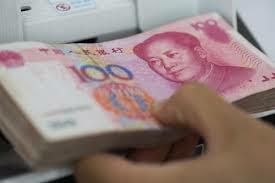 One solution for China in this situation is to devalue the yuan. This helps Chinese exporters to deal with dollar-denominated debt, and encourages the kind of internal inflation China needs to make its yuan-denominated debt sustainable. The problem is that when China has played the devaluation card in the past, the results have not been pretty for global markets. China pulled off a shock 3% yuan devaluation in August 2015 and U.S. stocks fell 11% in the next four weeks. China did another stealth yuan devaluation in December 2015 and U.S. stocks fell 11% from January to early February 2016. This article looks at potential ramifications of another Chinese yuan devaluation that may be in the works. It’s unclear where the damage will fall this time. Investors are well advised to increase cash allocations in their portfolios to help ride out the coming storm.